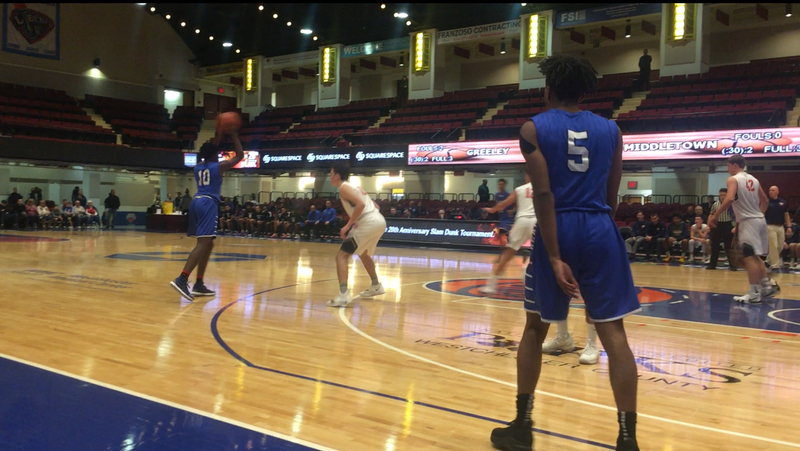 WHITE PLAINS — The game went exactly the way Horace Greeley hoped it would. Lots of crisp passes, a press-defense that prevented Middletown to run freely, and a post game. Behind a 29 point, 14 rebound performance from freshman center Nicholas Townsend, Greeley powered past Middletown 72-53 in the Slam Dunk Tournament Challenge Game. Middletown (4-1) fell behind in the first quarter 18-10, and had trouble making shots with Greeley’s tight man-to-man defense. It was the same song & dance throughout the game for the Middies, who failed to make many layups, and allowed a lot of them on the other end of the floor. Greeley scored 46 points in the paint, 30 of them were off second-chances. Middletown doesn’t play again until Wednesday, January 2nd at Poughkeepsie. Middletown senior guard Marquis Gill with six of his 14 points.